If you’re a general manager itching to cause a stir among your team’s most devoted fan base, you can announce that you’re moving one of your most promising pitching prospects into the bullpen. For as little as some fans might actually know, one thing that’s widely understood is that a good starting pitcher is better than a good relieving pitcher. More valuable, anyway. So fans are inclined to be patient, letting pitching prospects sort their things out. Moving to the bullpen is often considered a last resort. Something that should happen only to lesser players. Fans don’t love when it’s a move that’s made early. And just generally speaking, I’m sympathetic to that perspective. I’m mostly in alignment — I, too, like being patient with prospects. I want starters to have time to develop. But on the other hand, there’s the case of Edwin Diaz. Before the year, Baseball America ranked Diaz as the No. 2 prospect in an admittedly lousy Mariners system. Early in the season, the Mariners announced that Diaz was being transitioned to relief, citing an inability to learn a third pitch. At the time, the decision was questionable. I suppose it still is, and forever will be. But, why do teams move starters into the bullpen? Because relievers can move quickly, and the best ones can become hugely important. Diaz, already, has become hugely important. Diaz is already pitching like one of the very best relievers in baseball. I keep a notepad of potential writing topics to the left of my laptop. Weeks ago, I made note of Edwin Diaz, and I wanted to write about him, but I decided to give him more time. Then trade-deadline stuff moved the Diaz material to the back burner. The deadline, at last, is behind us. And Diaz just turned in a rather emphatically dominant performance Tuesday night. So, the time is now. Tuesday, Diaz debuted as the Mariners’ official closer, replacing Steve Cishek. He worked around a walk to otherwise strike out the side. If you know one thing about Edwin Diaz, you know about the strikeouts. When Diaz was converted to relief, he mastered Double-A opponents over a brief sample. That brief sample was enough for the Mariners, so they brought him all the way up. He’s been in the majors for roughly two months. He’s a righty with a righty-reliever arsenal: big fastball, slider, nothing else. It’s not the description of the repertoire that makes Diaz special. It’s what he’s done with the same repertoire. Diaz makes his most compelling case in the statistics, which to this point have been terrific to the point of absurdity. I’m going to show you Diaz’s statistical profile. In the plot below, you’ll see Diaz’s percentile rankings, out of all pitchers who’ve thrown at least 20 innings this year. Diaz has thrown 26, and 26 is not very many innings. No one could or would deny that. But the degree to which Diaz has been successful nips small-sample arguments in the bud. Even over just 26 innings, few pitchers could perform as Diaz has. If this were a video game, and Diaz’s ratings looked like that, you’d want to use him as often as possible. 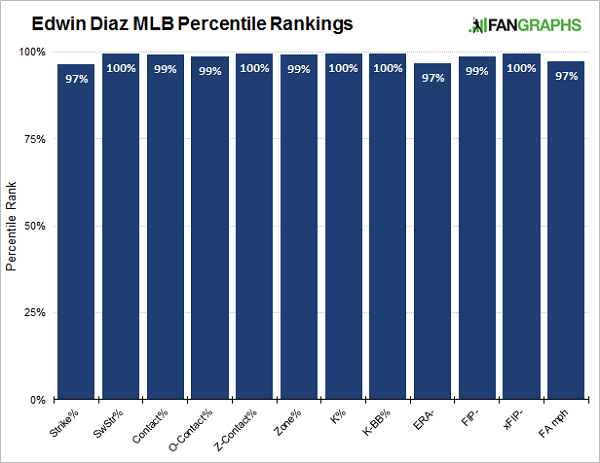 Every single one of those statistics is important, and in every single one of those statistics, Diaz has been amazing. One area where he hasn’t been so amazing is throwing first-pitch strikes, where his rate compares to that of Aroldis Chapman, but Diaz has a high strike rate overall, so he’s not to be thought of as wild. Nobody has a lower adjusted xFIP. Nobody has a higher strikeout rate. 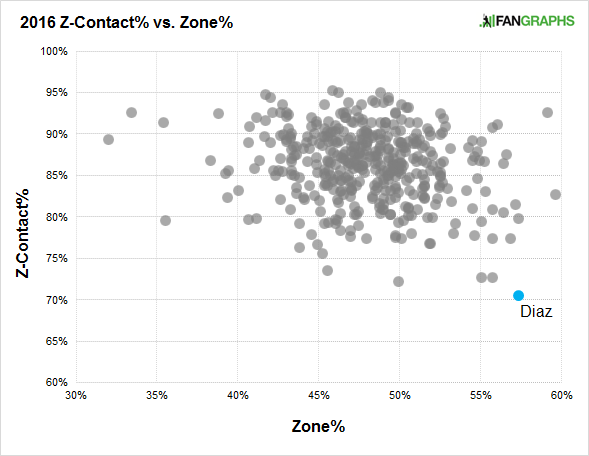 Nobody has a better contact rate in the strike zone. Diaz is sort of there by himself. There are two neighboring gray dots. Those belong to Chapman and Sean Doolittle. Doolittle, also, is dominant when he’s healthy. And that’s as a one-pitch guy. Diaz is working with two quality weapons. Diaz has had a slider for a while, but when he came up to the majors, at first, the slider wasn’t so sharp. After some conversations, Diaz adjusted his slider grip, and while that adjustment hasn’t altered the slider’s velocity or movement, Diaz has since been better able to locate the slider down and to the glove-side. Based on indications, the grip change has simply improved Diaz’s control of the weapon, and his numbers have taken off. I’ll warn you now: I’m about to take a small sample and split it into two even smaller samples. You have to do these things responsibly. But Diaz’s grip change gives me a reason. Before that happened, over 10 games, Diaz struck out 35% of opponents, with a 3.93 FIP. Since introducing the different, better slider, over 15 games, Diaz has struck out 56% of opponents, with a 0.13 FIP. His xFIP is in the negatives. Batters have made contact with barely half their swings. 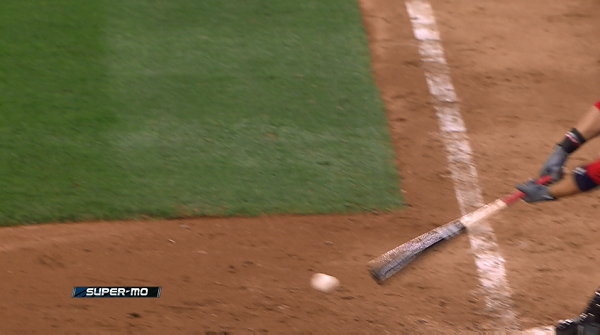 That was one of those in-zone fastballs. 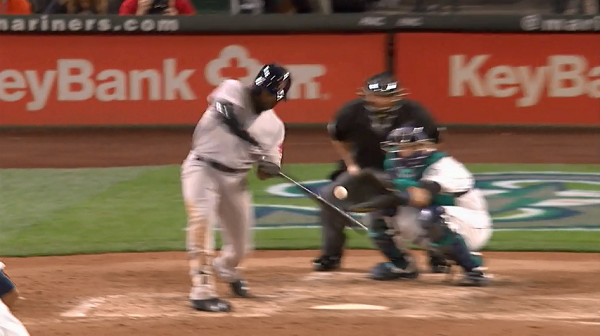 Bradley didn’t just miss it — he swung underneath it by inches. Leon’s bat, like Bradley’s, essentially pleaded no contest. Diaz has proven that he has the velocity. He’s proven that he has a good second pitch. He’s proven that he doesn’t need to lean on that good second pitch. He’s proven that he can stay in the strike zone, and he’s proven that even in the strike zone, he can miss a lot of bats. He’s proven he can miss bats out of the strike zone, too. There’s just one thing Diaz has left, and it’s nothing he can control on his own, for the most part. When I’ve scanned on Twitter, I’ve seen that a lot of Mariners fans are reminded of the promising early days of Rafael Soriano as a reliever. In 2003, over 53 innings, Soriano allowed a .462 OPS. In 2004, Soriano hurt his elbow, and it cost him most of two years. He was never quite so dominant again. But then, he still became a good closer. He didn’t dominate quite like Diaz has. And Diaz, for now, has his health. At present, Diaz is a new closer on a baseball team that probably won’t make the playoffs. If that team does make the playoffs, though, I imagine there’ll be one reliever in particular they’ll have to thank. We hoped you liked reading Meet Edwin Diaz, Your Newest Relief-Pitching Overlord by Jeff Sullivan! It’s like we got Chapman at the deadline for free, minus the criminal domestic issues. Touch wood he keeps his health.